1. 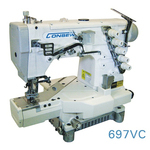 Cover Hem Stitch machines do an interlock stitch on hems, necklines, sleeves and seams. The stitches have double or triple needle topstitch with a serger type stitch underneath. You can see on the hems and sleeves of t-shirts and other knitwear. Fabric and stitch have a lot of stretch without breaking the seams. Sportswear/knits can be seamed together on the inside with 3 or 4 thread sergers at http://www.allbrands.com/products/abc0069.html Bottom hems, sleeves and necklines need a bottom coverstitch with two or three needle top stitching showing on the outside. These machines are at http://www.allbrands.com/products/abc0975.html. 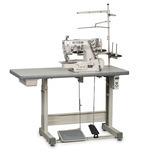 You can get seperate serger and coverstitch machines, or start with a combination 5 thread serger and coverstitch machine at http://www.allbrands.com/products/abc0275.html. You can construct Tshirts with combination serger (side seams and set in sleeves) and coverhem stitch (hems and necklines) machines at http://www.allbrands.com/products/abc1918.html Then you can use a heat transfer press to imprint designs and lettering at http://www.allbrands.com/products/abc1909.html Hope this helps. 2. The best portable 2 or 3 needle dedicated cover hem with single needle chain stitch machines are Brother and Janome. 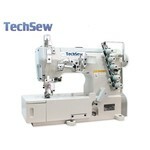 Brother 2340CV at http://www.allbrands.com/products/abp13045.html with 1 needle chainstitch, 2, or 3 needle cover hem stitch 1/8" 3mm or 1/4" 6mm wide. 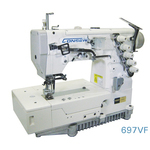 Janome 900CP at http://www.allbrands.com/products/abp14443.html with 1 needle chainstitch or 2 needle cover hem stitch 3/16" wide only. GK257FS does not have the needle guards that help prevent skipped stitches, and has to be set up for a particular application (fabric, thread, tension) such as knit lycra spandex or woven materials. They are much more sensitive to changes in fabric, thread and tensions. GK257 has single chainstitch or two needle 5mm cover hem stitch. GK357 3 needle has 1/8" and 1/4" cover hem stitches.